RescueTime enables you to get a handle on your life and on your work, providing focus and drive where previously there was distraction and procrastination. The internet is something of a double-edged sword for businesses. On the one hand, it provides us with the communicative tools and high-tech platforms required to really launch our organisation. On the other hand, it presents us with a range of fun and distracting alternatives to actual work. RescueTime tracks and logs the time you spend on other tasks and applications, helping you to understand exactly how you are spending your day and how you could be improving your efficiency. RescueTime is an application which runs unobtrusively in the background on your computing device, operating with minimal CPU usage while you go about your day. Whenever you access a website or application, this behaviour is logged, along with details such as how much time was spent on that task and the usage behaviours this led to – for example, purchasing items, completing business admin, or streaming non-work-related content on YouTube. This data is made accessible to users in the form of a report, which enables you to gain a clear understanding of how you are spending your day. When are you at your most productive? This is when you should be scheduling your most gruelling tasks. Get easily distracted just before lunch? Use this time to get some exercise or to do something relaxing but worthwhile. What you do with the information is up to you, but no one can deny that it is useful and sometimes a little sobering! The RescueTime app is slimline, doing its thing on your computer while you make yourself busy with other things. It won’t slow your computer or your network down. Self-discipline can be difficult, and we love the way that RescueTime takes this out of your hands, allowing you to make your own judgements on whether your work efficiency is truly optimised. If you find yourself consistently distracted by the same things, RescueTime includes a blocking function to make you think twice about time-wasting in this way. Leaving the question of efficiency to one side, the app also provides a handy reference point, integrating with your work management systems to help you keep track of the tasks you are working on. 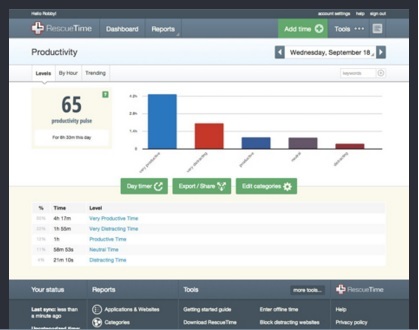 RescueTime is available to all on a free 14 day trial.